Your plumber for Houston Tx & surrounding areas, serving residential and commercial clients for all plumbing and gas systems. Herrera management and staff are committed to outstanding customer service and will go out of their way to ensure that your problem is resolved quickly and efficiently. We are your one-stop community plumber working hard every day to ensure that you receive affordable and individualized attention. We understand that you need a Houston plumber you can trust to work in your home. Every plumber on our Houston team is a valued long term employee with many years of plumbing experience. Our professional plumbers have an average tenure of 13 years with Herrera Plumbing Service. We pride ourselves on the quality of our people and offer the extra assurance of extensive background checks and individual drug testing. or complete the quick contact form on the right of this page and we will contact you to follow up your enquiry. 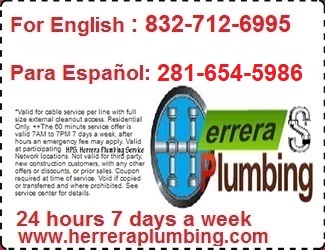 Herrera Plumbing Services And Houston TX And Surrounding Areas! Hate talking on the phone? We now offer our clients the ease and efficiency of Scheduling your Appointments online. You can arrange for an expert Plumber to attend your home or business by submitting your request below. Our Plumbing Project Coordinators will get back to you in 20 minutes or less. All appointment requests/emails go directly to our office staff assuring you a "Rapid Response"
Is your drain clogged, overflowing or running slowly? We use the most advanced technology available to identify the source and eliminate any stoppage. Our expert plumbers are ready to help with water heater installation, repair or replacement. Call today for help with your Gas, Electric or Tankless water heater. Worried by a water leak from a wall or ceiling, flooding from a burst pipe? We are experts in leak detection and emergency plumbing repairs. Call now. Is your toilet clogged, backing up or constantly running water? Faucet broken or leaking? Call today for help from an experienced plumbing professional.